Japan is so heavily promoted as a source of low km cars that often buyers don’t realize that Japanese cars can easily travel over 50,000 km PER YEAR. These cars are specifically targeted by false km scam professionals, who make large profits at YOUR expense. They look for vehicles under 3 years old. Why ? There is a very good reason for this. 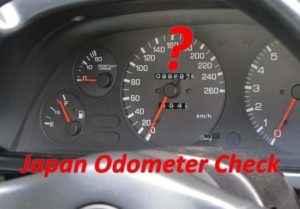 The first re-registration on regular passenger cars in Japan happens after 3 years, at which point the km are recorded by the Japanese Registration Authority during the mandatory safety inspection. This official km record is shown on the registration and export paperwork. It can be used against the dishonest importer / dealer in court. So they buy cars WITHOUT this record to make it much harder for you to take any action against them. To maximize their profit margin they look for cars with significantly higher km than the Japanese average of about 7,000 km / year. This can be a huge saving for countries such as Malaysia (where the market is so full of falsified “near new” Japanese imports that it’s virtually impossible to buy a genuine car). 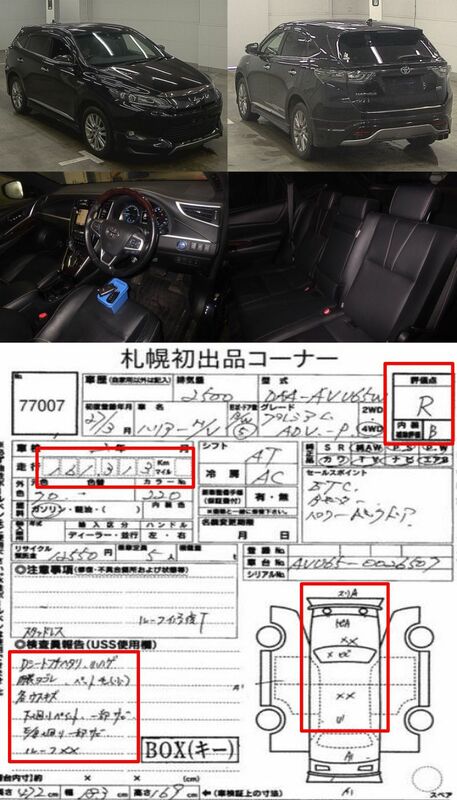 For a 2015 model for example, the false km scam professional will look for one with around 60,000 km or more. Even better if it has had accident repair, repaint or existing body damage – this will further reduce the price. The interior should be reasonable, as it is much easier to repair and detail the body than hide wear to interior parts like seats and steering wheels. So ideally it would be graded B interior or at least be clean and tidy. Remember, these fraudsters earn their living by deception and are pros at it – the average person would have no idea they’ve been scammed until later down the track when the car starts giving them trouble well before it should. 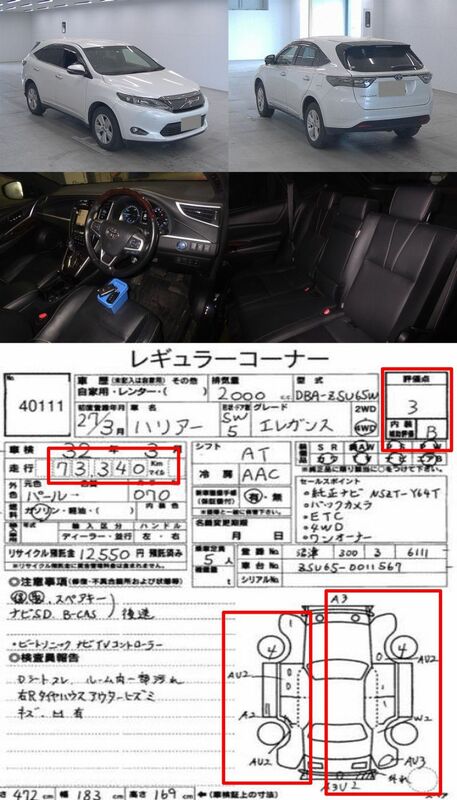 Below are two typical examples for the Toyota Harrier which is a very popular secondhand car from Japan, but many other luxury branded vehicles such as the Toyota Alphard and Vellfire are affected by the same false km scam. Cars just like these are having their odometers wound back and sold with 5,000 to 15,000 km EVERY DAY around the world. We also see the year being falsified, so a 2015 will be sold as a 2016/17, and a 2016 as a 2017/18 etc. Without checking the past auction data there is no way the average person would know. The good news is that we can provide this data with our Basic Report for only 40 USD. We aim for speed, and will usually have the report to you within an hour. Make sure you check BEFORE buying the vehicle. Afterwards is usually TOO LATE to do anything about it. 2015 Toyota Harrier Premium, VIN: AVU65-0026507. 161,313 km. Grade R – repairs to front and roof. Clean B interior. Sold for $17,500 USD at USS Sapporo auction on 18 April 2018. 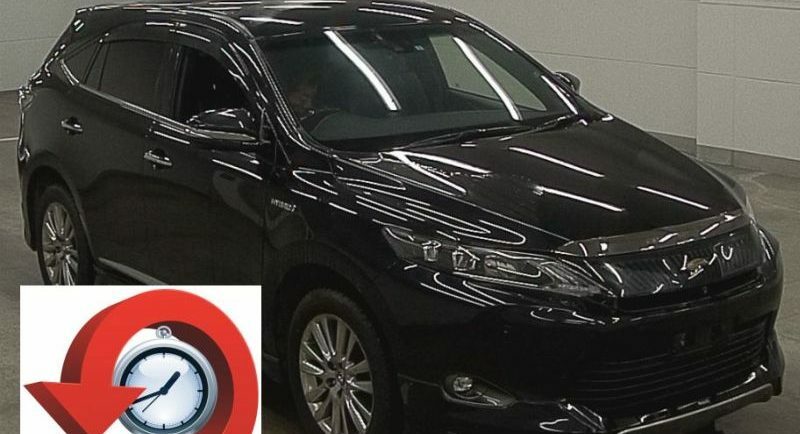 2015 Toyota Harrier Elegance, VIN: ZSU65-0011567. 74,340 km. Grade 3 – existing large dents and scrapes to most of the body. Clean B interior. Sold for $17,800 USD at USS Shizuoka auction on 7 April 2018.